Looking back over the Space Shuttle era one can only wonder "what might have been". So much occurred in the first ten years of the space program that the second decade of space was a letdown. The dreams of generations of children that lived during the space age faded as interest in space exploration and questions about our future in space seemed to hang in the balance during the seventies. The increasingly rapid pace of society enabled by cultural and technological change had made us far too impatient to tolerate gaps in anything. We are always looking for the next mountain to climb and the next hill to take. Delays and indecisiveness pushed us to other interests. So it was when Gene Cernan stepped off the moon and America’s future in space depended on a patchwork of programs and promises built on a foundation of shifting sands. There were no guarantees that tomorrow’s space program would exceed the heights reached by Apollo. Endeavour's landing and Atlantis rolling out to the launch pad is reminiscent of Apollo 16 and Apollo 17. The end of an era was near and no successor, no bigger mountain to climb was in sight. Between the end of the Apollo era and the beginning of the Shuttle era there was Skylab and the Apollo-Soyuz Test program. While impressive on their own, they were short-lived. Cobbled together using leftover hardware from the space race they were not the future, but merely a placeholder until a new space age would arise. The second decade of the space age would vanquish thoughts of humans of Mars by 1980. Instead, the future of human spaceflight would rest in low-Earth orbit with the Shuttle. The Space Shuttle was supposed to dominate the next decade of flight. The Shuttle program would help us build space stations that would set the stage for deep space exploration. The reality would be something much different. The Shuttle would go on to serve for thirty years. Envisioned to fly more frequently, the Space Shuttle’s 100 flights per vehicle life was expected to used in a short ten years and from there we would move to the next evolution of space exploration. The Shuttle however would become a poster child of failed Government strategies for space exploration and endless political conflicts over budgets and priorities. The reason for building the Shuttle was to save money getting to and from space. 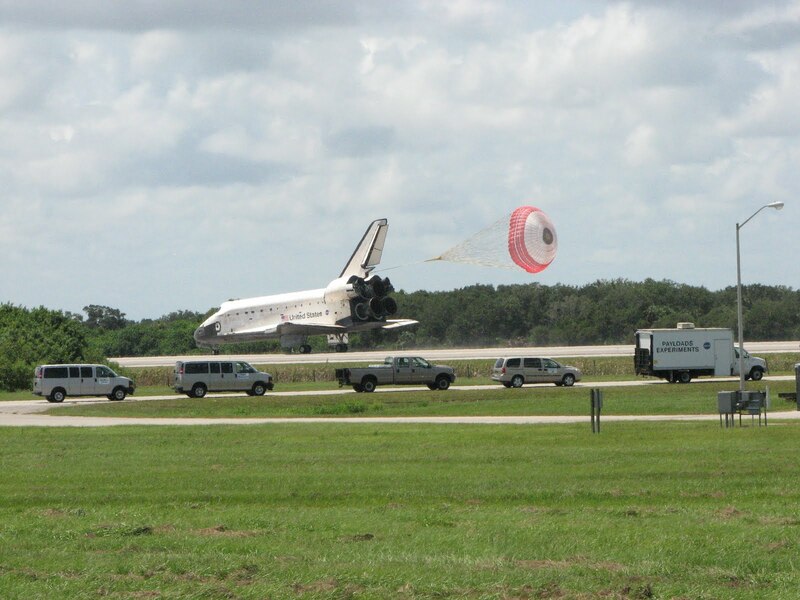 Creating a reusable vehicle with a fast turnaround that could make space travel akin to boarding an airplane proved too costly. Finding a cheaper way to perform the task would lead to compromise. The Space Shuttle as it exists today was the result of that compromise. A hybrid of ideas that could be afforded and sold to Congress and not what was needed, cost-effective or sustainable in the long-term. As it would turn out, the finished product would prove to be complex and difficult to maintain. Schedules could not be met and the very costs that the Shuttle was supposed to contain only served to constrain further ambitions in space. The Shuttle became so expensive to operate that little money was left to fund development of replacement vehicles and launch platforms. Still, no space platform before or since could do what the Shuttle could and it will likely be a long time before we see the likes of it again. Political wrangling and strategic missteps would leave the Shuttle flying without a destination for a third of the program’s life. A decade of the Shuttle's potential was lost while Congress squabbled over building a space station. Thirteen years after its first flight the Shuttle would finally find a home in space, the Russian Space Station Mir and eventually the International Space Station. That the Shuttle remains a technical marvel forty years after engineers began sketching its design is a testament to NASA’s technical prowess in an era before computers could model every possible scenario such a vehicle would encounter. For all the things the Shuttle could do, the one thing is could not achieve was a record of safety and an efficient cost of operation. None of that though falls on the vehicle itself, but to those that put short-term expense ahead of long-term benefits and savings. The Shuttles may hold the title for another 30 years or more of being the most remarkable and complex machine humans had ever built. When John Young and Bob Crippen flew aboard STS-1 even the casual observer would admit that it looked dangerous. It would be an unusual configuration with solid rockets attached to a large fuel tank and what amounted to a passenger plane mounted on its side flying manned without a test fight. If air travel worked like the Shuttle, none of us would fly. There were too many dangers and risks to ever make it safe. Beyond what the eye could see there were another two million parts and miles of wires that had to all perform flawlessly under the harshest of conditions and do it time after time. In the world of rockets and space travel minor problems can lead to big trouble and twice that system failed. The Challenger accident made the Shuttle safer, but Columbia proved that it could not be made safe. 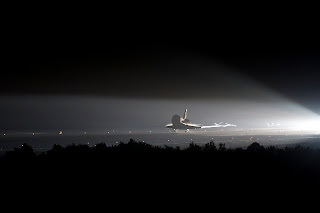 The last flight of Endeavour proved that the threat of mortal damage to the Shuttle still haunted each flight. We could all breathe a collective sigh of relief when Endeavour’s wheels rolled to a stop and the damage proved to not be a threat to the crew. On a night when the Space Shuttle Atlantis moved to the launch pad for its final flight in July, Endeavour’s work would be done. Endeavour flies one more time on the back of the 747 Shuttle Carrier Aircraft as it will head west to Los Angeles sometime in 2012. I would like to be there when the Shuttle’s depart for their last destinations. In the early 80’s, the Space Shuttle Enterprise riding on the back of its 747 made a promotional pass around Baltimore on its way back from the Paris Air Show. I snapped a fuzzy Polaroid of it off in the distance. I took great care to be where it was supposed to flyover, but it flew a different route. That photo has been lost over time through various moves. 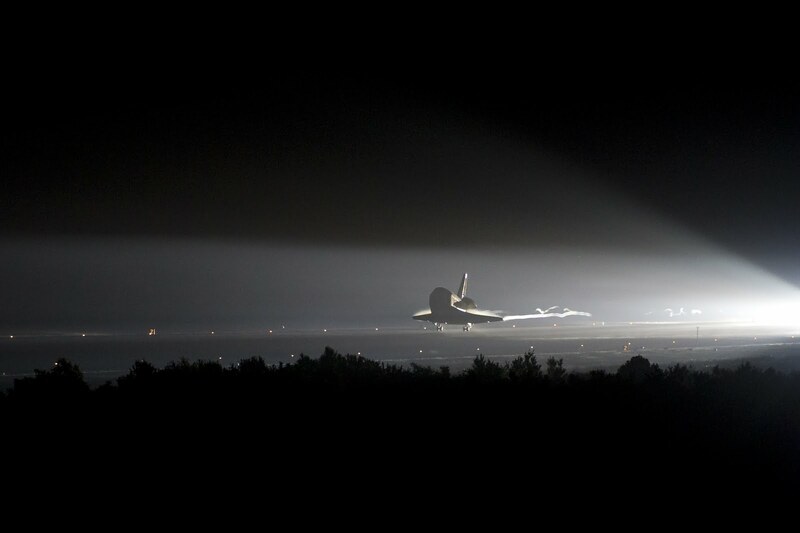 It’s the one photo of a Space Shuttle that I would like to get a chance to take again. 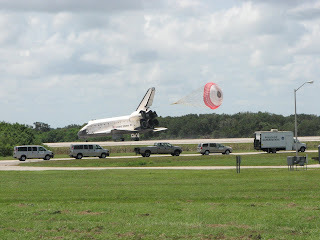 Still, I have had the privilege to see several Shuttle launches, two Shuttle landings (including one of Endeavour), numerous scrubs, and one distant and hazy flyby of the Space Shuttle Enterprise. My home and office are adorned with pictures of the Shuttle launches and landings I have witnessed and now just one more picture to add to the collection, the final launch of the Space Shuttle program. I wish the Shuttles could keep flying, but their time has come to be retired. Things that were supposed to go wrong with the Shuttle never did and things that were not supposed to be problems proved persistently problematic. Even with two crew losses, we can only assume that we were luckier than perhaps we should have been and that retiring the Shuttles now avoids the next accident in waiting. I am glad that Endeavour and her crew are home safe and I look forward to making a future trip to Los Angeles to see it on display at the California Science Center. Welcome home Endeavour.